As you all know, I am about to embark on a 30 day trip to Europe! I am over the moon excited and really cannot believe that it is almost here. Before I go, however, there are still a few things that I need to pick up so that I am fully prepared for my travels. With less than two weeks until my departure, I have started to make (many) lists of all the things I need to buy/pack. I thought I would share with you some of my travel essentials that will serve you well on any trip you take whether is be just a long weekend getaway or a 30 day adventure across Europe. 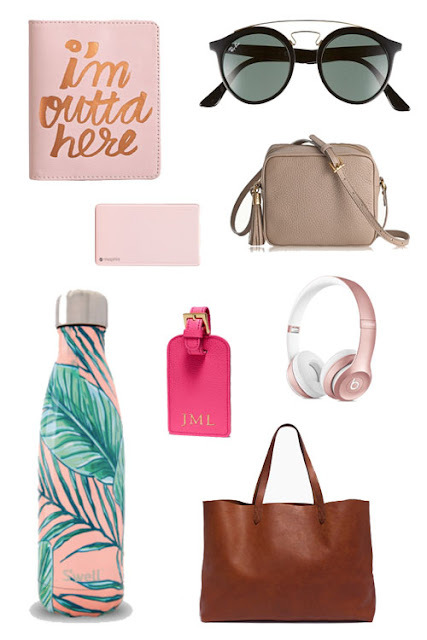 The great thing about many of these travel essentials is that they are things you probably already have in your closet and if not are all items you can use in your everyday life while you aren't traveling. It's a win-win! 'Outta Here' Passport Cover // How cute is this!? A passport cover is the perfect item to make travelling a little more chic. In a sea of boring navy blue passports why not have yours stand out a little bit? Crossbody Bag // When spending many hours sightseeing and walking around exploring new places, a crossbody bag is key to help only carry the essentials around. There is nothing worse than having too much stuff to lug around all day, and this adorable crossbody is the perfect spot for the things you need most. Portable Phone Charger // This is a must. Not always having access to an outlet is one of the few minor frustrations about traveling. In this day and age it is crucial to have your phone charged for any photo-op that my come up, but it is even more important while traveling. You just cannot have a dieing phone while trying to snap a picture of the Eiffel Tower! S'well Water Bottle // I have had my eye on a S'well water bottle for quite some time now and recently was given one as a gift. It's safe to say that it is absolutely worth it. It truly keeps cold drinks cold for 24 hours and hot drinks hot for 12, which is perfect when you're out and about for long stretches of time! It's also super important to stay hydrated while traveling, and nothing makes that easier than a cute water bottle. Luggage Tag // I hate to even bring up the topic, but in the situation of lost luggage (nightmare) a luggage tag could make a huge difference. It's a tiny, cute accessory that could be potentially make recovering lost luggage a little bit less of a headache. Headphones // This one is pretty self explanatory. Perfect for long flights and bus rides where Netflix is a must! Tote Bag // The perfect tote bag is an essential for any and all types of travel, and can have many purposes throughout a trip. It is ideal to find a bag that can function as a carry-on and then easily be used throughout a trip when needed. It is always a good item to have for days when the crossbody bag just isn't cutting it! Hope you enjoyed the tips and maybe you're even feeling inspired to book a trip of your own!